The Akshaya Patra Foundation runs one of the largest NGO-run school meal programs in the world. Currently feeding over 8,30, 000 underprivileged students every day, the program is a strategic intervention in education aimed at effacing two of the most debilitating problems facing India for over decades now- hunger and poverty. The Foundation aims to scale up the program to serve one million children by 2010. Lokvani had an opportunity to talk to Desh Deshpande – Akshaya Patra Board, Madhu Sridhar – President Akshaya Patra USA and Saluni Fadia - Chair Akshaya Patra Boston Chapter about Akshaya Patra and the fundraising event. Why were you drawn to make Akshaya Patra a focal point of your charity efforts? Because Akshaya Patra is a great example of what non-profit organization can achieve; cost effective scalable solution with very high quality service delivery. In a short time, Akshaya Patra has grown to become the largest, and certainly most innovative, school lunch program in the world. You are a leading entrepreneur and place a great emphasis on innovations. What specific innovations differentiate Akshaya Patra from other programs that are targeted towards providing free meals to children? There are three things that are coming together in India: a need for scalable solutions, solutions that are affordable and the new found confidence that enables people to take on challenging problems. Akshaya Patra combines all the three elements to bring a solution to millions at a very affordable cost using a very sophisticated model. People in the past always equated low cost to mediocrity. 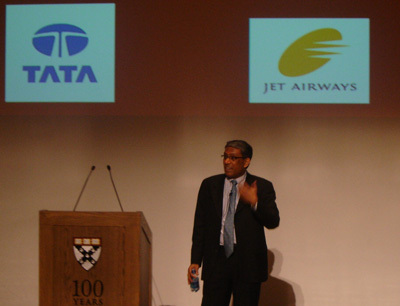 However, because of the scale of the problem that needs to be solved, Akshaya Patra uses and has attracted the best talent and the best management techniques to achieve its goals, and as a result, its accomplishments as a non-profit are similar to what Ratan Tata has been able to achieve in the for-profit world by designing and manufacturing the “Nano” car. This is very exciting for me. I feel that the biggest contribution that India can make to this world will be to showcase how non-profits can work with the government and use the best practices of the open market economy to intervene and provide the solutions for those whose needs are met neither by the market nor the government. What compelling case can you make for people to donate their precious charity dollars to this cause above others? India is a country with a billion people. Even though there is a lot of hype about how the Indian economy is growing at 10% every year, there are millions in India who go hungry. We need to design and support programs that can help them to make an impact. If we feed a million kids for a generation, we will alleviate poverty in a million homes. This program is not about providing a meal to a hungry, but providing an opportunity to a young kid to realize his/her full potential. Why did you agree to join the Board? I am looking for opportunities where I can have an impact. This is an organization that has the potential to have a huge impact. Madhu Sridhar, President of Akshaya Patra, is a good leader and I would like to assist her to get lots of people involved in helping this organization grow. What is the current status of Akshaya Patra? Akshaya Patra was the talk of the town in Bangalore last month when over 250 CEOs and community leaders gathered to celebrate the accomplishments of Akshaya Patra. Narayan Murthy, chairman of Infosys congratulated Akshaya Patra for its outstanding results achieved in a short period of time. He shared his thoughts on how to ensure its longevity and sustainability. Akshaya Patra was also the talk of the town this month in Washington DC at the Global Child Nutrition Forum where Akshaya Patra was recognized for its extraordinary contribution in alleviating hunger and promoting education. In addition, Harvard Business School is using for their MBA program Akshaya Patra as the case study for precise time management. Finally, Cisco announced the Harvest of Hope, Feed a Child Program in partnership with Akshaya Patra on when they launched their campus in Bangalore in October. Donations made to Akshaya Patra by Cisco employees both in India and the US were matched By Cisco. What are your short term and long term goals for Akshaya Patra? In the short term, we plan to focus on sustaining the program by continuing to feed 830,000 children and progressing to our one million children goal by 2010. In the long term, we want Akshaya Patra to realize its full potential by expanding the program and duplicating this model not only throughout India but also in other parts of the world so that no child is ever denied education because of hunger. We obviously need to raise funds to meet our goals. These children are being fed every day and we need to provide financial and moral support to the organization. The focus of the US office will be to raise awareness that Akshaya Patra has a scalable solution and a proven track record to address simultaneously twin challenges facing India – hunger and education among underserved children, the most vulnerable segment of our society. India is home to 57 million malnourished children living in abject poverty. Approximately 25 million primary school-age children are not in school. For those enrolled, 40% drop out before reaching Class V. Literacy, especially among women, remains low. Left unaddressed, our demographic asset can quickly become a demographic liability not only for India but it will also have a negative impact globally. I will strongly encourage everyone to visit the kitchens in India on their next trip and lend both their appreciation and suggestions for improvement. Our goal is to engage the community in addressing this challenge. We must take individual responsibility and be part of the solution. It is our collective challenge. It is our obligation. It is a measure of our humanity. Why did you consider Akshaya Patra worthy of attention? Living in a global village of abundance and still having several million children in India starving of hunger and denied the opportunity for an education brings into focus the work Akshaya Patra is doing. Very few NGO's in the world are doing the work which needs to be done to feed these children in India and participate in their upliftment. I applaud Akshaya Patra's commitment to feed 1 million children in India by 2010 and help them gain an education. Our decisions today can influence hundreds of millions of children’s and their future in India. What are your plans for the Boston Chapter? Currently, nation-wide efforts are being made thru the various Akshaya Patra Chapters to bring awareness to this issue and find support to meet their goals. I am delighted to share with you that we have an esteemed group of people who have come forward to work with us on this cause and play a role as an Ambassador or a Champion to the Boston Chapter. The Boston Chapter formed in 2008 is supported by four ambassadors and eight champions, who are working very hard to raise awareness, generate interest towards the program and bring in funds to support our goals for 2008. Our Ambassadors, Dr. Puran Dang, Dr. Shadev Passey, Upendra Mishra and Smita Patel are all well respected members of the community and bring their vision, knowledge and expertise to this Chapter and provide us with a constant source of leadership and guidance as we move forward. Medha Ganmukhi, Theresa Dave, Meena Rajgopal, Ravi Mantha, Nithya Das, Nimisha Seth and Raj Loch as the Champion Circle members are all working very hard to meet the 2008 goals for the Boston Chapter by bringing a variety of programs and events to entertain you, challenge you and garner your support as you all come and join hands with us to find solutions to this eminent challenge. The Boston Chapter has planned several important activities and events for 2008. In the fall of 2008 we are putting together the Walkathon Event around Gandhi Jayanti. We have a commitment to raise over $30,000 for this event. And last but not the least our big finale for the year will be the Akshaya Patra Gala on Sunday September 21, 2008. The venue and program will be announced later during the year. So please mark your calendars for these upcoming events and we hope to see you all soon. Could you describe the event on March 30? Our first program for the year is the Odissi Dance Recital show on Sunday, March 30, 2008 at the Roger's Auditorium in Andover. We encourage all of you to join us at this event and show your support to our cause. Talented young performers who have been learning the Odissi dance under the leadership of Mouli Pal from Winchester will make this program memorable. Mouli and her team of students have committed their time, energy and heart to this show and are also making a pledge to donate all the funds raised thru this dance to the Akshaya Patra Boston Chapter. I am sure this program will bring joy and happiness to you. I look forward to seeing you along with your families at the show. To show their support to this cause and also come together to do something for the children of India thru this innovate program. It is important that we be part of the solution to this problem and help in uplifting these children.